Metal Textiles Automotive Products meet a wide range of critical needs – from providing flexible, yet durable high-temperature seals and joints to noise attenuation, thermal insulation and filtration. 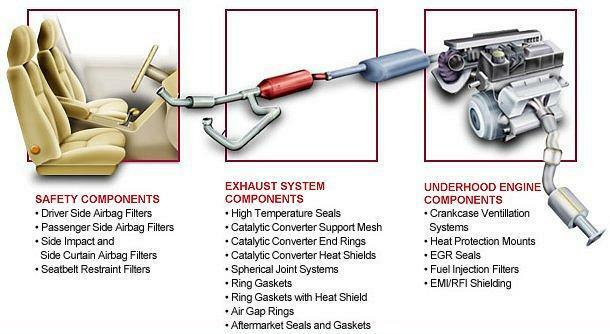 Our exhaust, airbag, sealing and filtration products can be found in passenger, light truck and all-terrain vehicles, internal combustion engines and diesel trucks, earth-moving equipment, and recreational vehicles. Knitted wire mesh not only provides a higher level of integrity, but our engineered sealing, gasketing, filtration and heat management solutions are cost effective, economical solutions in comparison with other technologies.